What an intriguing day yesterday was…the end of days, no less. Well, we’re all still here. No apocalypse. Bit of a fizzer, really…a little bit of excitement might have been good! Even though the end was nigh, I set out to my local shopping centre because I thought of a great book as a Christmas present and it was too late to order it online. I love books. I love bookshops, I love giving books as presents and I love people’s collection of books in their homes. I have some close friends who have wonderful libraries and whenever I visit them, I always spend some time looking through their books and generally borrowing one or two to read. I found myself reeling in shock, however, when I saw that two of the big, reliable bookshops that had always resided at the shops, were gone. I literally had to walk from one end of the shopping centre to the other – ducking into Target/ Big W/ Myer (who do have books) looking for what I wanted, but to no avail. They only had a few aisles dedicated to ALL ages – half of what was on offer being cookbooks! What I was left with was a sore knee and an indignation that ran deep. It was depressing on two levels – 1) disappointed that I had nowhere to peruse. Perusing is the best, something that just can’t be done on-line and 2) a wonderful tradition is being bullied out. I stated my frustration on my Facebook page and found the majority of comment-makers concurred with me, whilst others suggested I give electronic readers a try. I have heard this argument before from a few friends and respect their freedom of choice in reading that way – but besides them holding 1000 books, I can’t see the appeal. That’s the ONLY positive point, right? I like to flick – sometimes a page back – sometimes a few chapters back. How easy is that on a device? That’s actually a rhetorical question – I’m not here to be convinced to read off a screen. I just did that marking the HSC and it did my head (and eyes) in. Now for the great part of this tale. I few posts ago – Physiology – I recounted the joy of receiving a set of Children’s Encyclopedia Britannicas from 1970. The same man who found those, brought me my Christmas present yesterday evening. 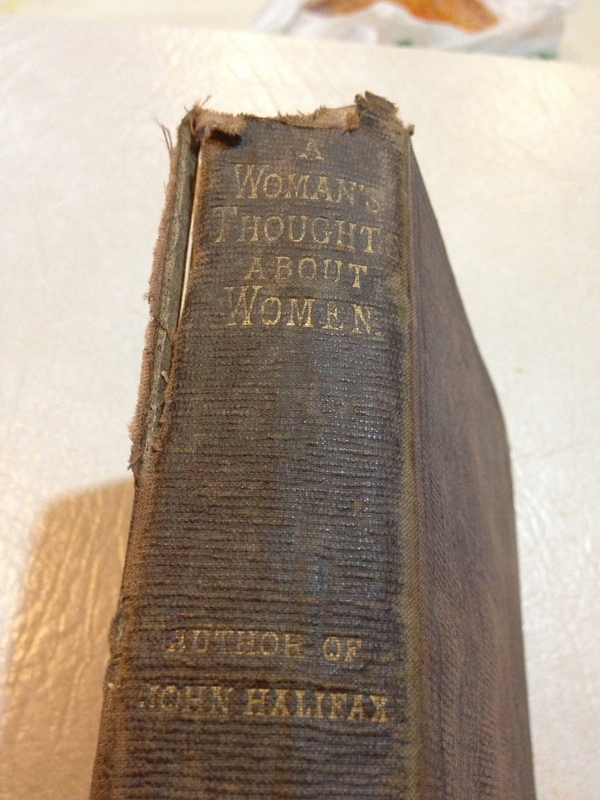 A book called, A Woman’s Thoughts about Women. Now I’m sure you’re wondering who it’s by. A woman, of course, but who? Well, this is where I had to use the irreplaceable Internet to look up who penned this treasure, because her name isn’t mentioned anywhere in or on the book. And the answer is?…Dinah Craik – an English novelist and poet. 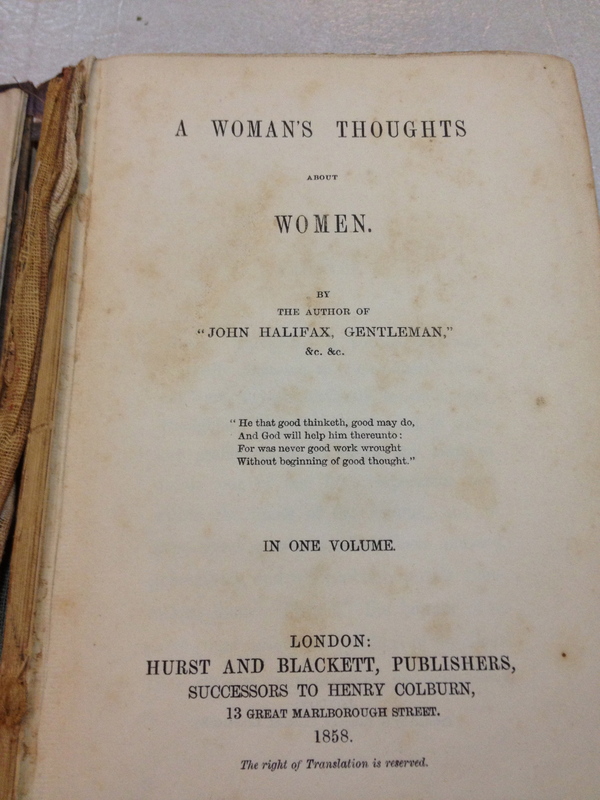 In this book she is only known as the author of her supposed best work, ‘John Halifax, Gentleman’ (1856). Interesting. So, on this day when the world was to end, I found myself navigating (pendulum style) through this conflicted new-age world and how it reads and cherish books. From feeling quite glum about how decidedly books are being substituted with technology – to feeling elated (and it was elation) at receiving this rare and unique gem. Question #124: Does technology have to take over everything, just because it can? I’ll be back soon with snippets from this book – I can’t wait to jump in a see through the eyes of a woman from 1858. I felt the same pain when the bookstores closed here. Nothing can replace the fun of walking down aisles of books, pulling down the surprise finds you wouldn’t know existed without seeing them on a shelf. It IS depressing. I love books. My house is full of them, and though I have an e-reader, it doesn’t give the same experience as a real book does, though it does save on shelf space and many books by Indie authors are available for almost no investment. But I shudder to think the day may come when an actual book becomes a luxury item that few people can afford to buy. Your Xmas present is wonderful. Enjoy it! Thank you, Cynthia! You’ve hit the nail on the head – the argument for having e-readers, like downloading Indie writers, sounds completely logical. I can also see the allure of having plenty to read when travelling / going on holiday. I may end up getting there one day. But at this point, I don’t have a need. But it breaks my heart that people aren’t buying books. I spoke to the lady in the only bookshop in quite an area and she said that they have to pay really high rent. If rents went up and the amount they were selling went down…well it’s no wonder bookshops are going under. BUT…I will enjoy my new book! It certainly seems the way it’s going. Wonderful post! Nothing can ever replace the magic of a good old-fashioned book. And what a wonderful gift. Enjoy your Christmas read! Thank you! I’ve read some interesting bits so far that I’ll pass on…as soon as the Christmas crazy-time passes! Yes, good luck with that. I’ve signed up to your blog in antici…. pation! Your post is spot on, and as a wanna be Teacher Librarian, you can only imagine my disillusionment with finding a job which apparently is becoming obsolete. The instant gratification that comes with purchasing a book via e-reader is what I love the most, & often I will buy the hard copy to keep if I really enjoyed the book. I too, will find myself buried in people’s bookshelves in their homes as I also believe they are an avenue into their soul…I hope one day I wil have an entire room of my house dedicated to books I’ve read for my children. And what an amazing artefact, keep it in a safe place, sealed in a gladwrap bag – you’re holding onto a piece of history. 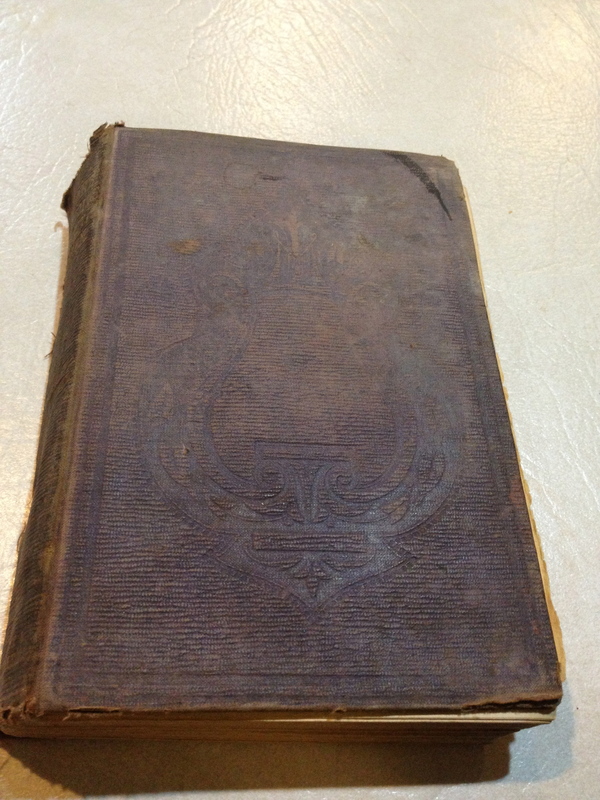 It’s exactly that, a piece of history – an original book from 1858. …and it’s a woman’s voice from the time, to boot! I can’t tell you how stoked I am.